Since its inception in 1922, the Texas Cowboys service organization has been an integral part of the University of Texas at Austin. Members (and alumni) of the Texas Cowboys have proudly provided the UT campus with leadership, character, spirit and service (both before and after graduation). 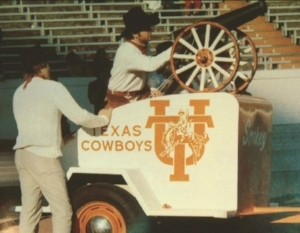 After the Texas Cowboys' registration as a campus student organization was canceled in 1995, many of its alumni were concerned that a great loss would occur on the UT campus if the Texas Cowboys were not ultimately reorganized and reformed. Accordingly, Texas Cowboys alumni have organized the Texas Cowboys Alumni Association to assist in the reorganization and guidance of the Texas Cowboys student organization and to maintain a continuing relationship of support to the student organization and to the University of Texas. To serve the University of Texas at Austin by promoting the spirit and high ideals of the Texas Cowboys, fostering positive relationships among all members of the University community, and assisting in the guidance of the campus Cowboy organization. The University of Texas found itself in need of a men's service organization. Two men, Arno Nowotny, then head cheerleader, and Bill McGill, president of the Longhorn Band, began working together to recruit dedicated men who could not only lead but who could also serve. Forty men from all aspects of campus life were chosen by McGill and Nowotny to be the first Texas Cowboys. The Texas Cowboys quickly establish themselves as The University's premier service organization. The Texas Cowboys begin their involvement with the Austin Association for Retarded Citizens (ARC). Over the past 50 years The Cowboys have contributed with their time and over $250,000. 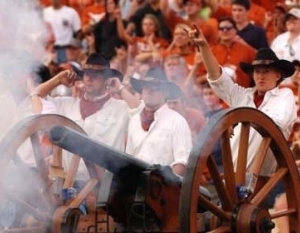 Also that year "Smokey", the original UT cannon, is presented to The University by The Texas Cowboys. The Cowboys fire Smokey during the Austin Ceremony after the death of President John F. Kennedy. On the Monday following the assassination, Smokey fired a 21 gun salute to the fallen President. It was the climactic moment in a public Ceremony in front of The State Capitol. Additionally, during the 1963 Texas Longhorns football season, Smokey, the restored model now located at the Cowboys Pavilion, was fired by the Cowboys for 10 of the Horns' 11 home & away games, including the January 1, 1964 Cotton Bowl Classic victory over Navy, as The University of Texas captured its 1st National Football Championship. Smokey II is created and serves The University well until 1988. Smokey III, a civil war replica cannon standing six feet tall and weighing 1,000 pounds, is constructed and is currently in service. The Texas Cowboys Alumni Association is created. The Texas Cowboys Alumni Association, in conjunction with the Texas Exes, construct the only structure on The University of Texas campus named after a student organization - The Texas Cowboys Pavilion.